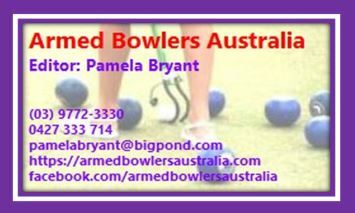 I am very happy to open a new category that presents our Armed Bowler Community in a new light. I’ve chosen to top this list with no lesser a bowler than John Snell O. A. M. and Bowls Australia’s first “Hall of Fame” inductee. John’s story follows but although his accolades mostly pre-date his 2012 uptake of the Mechanical Bowling Arm, he has continued to amaze us through his dedication to master this aid. I’m pleased to say that he played his first Armed Tournament at the Edithvale Bowling Club on the 20th Mar ’16………as a Lead to Skip Michael Rose, a bloke he coached but one who had only 3 months experience with the arm. They won all 3 games with 33 shots up! Not bad eh? John Snell was born in 1934, mid – depression, at Jerilderie (meaning reedy place) in the far south west of NSW. In 1879, Jerilderie’s bank had been relieved of two thousand pounds by the infamous Ned Kelly, (a fact that would not be lost on our Banker – John Snell), and another John, Sir John Monash, was also born there. Alby Ashley – The Visionary who got us started. It’s been 10 years since Alby Ashley had the vision to start up the first Armed Bowlers Tournament. Churchill’s words “Never, ever, ever, ever, ever give up!” come to mind when you ponder the life of Arch Baxter, born 1st July 1930 in Edmonton, London just down the road from Churchill’s Oxford birthplace. Arch lives in Elizabeth, South Australia and joined the Elizabeth Bowling Club in 1983, in his 50’s having never tried the sport before. He is now in his 33rd year there, but no reflection on him, the Club as he knows it, is closing its doors this month to amalgamate with Munno Para Bowls Club. Both Clubs will compete under the banner of the Playford Bowling Club at Munno Para while they await the construction of new greens (one under cover) at the old Elizabeth site. About Barry Atkins – Central Highlands Bowls Division, Victoria. Barry Atkins might appear a bit Grumpy at times but believe me he’s as soft on the inside as he is cuddly on the outside. I first met Barry through Armed Bowling and enjoyed the odd occasion when I got to share and observe his Coaching prowess. Coaching has been a lifetime passion with Barry and his dedication has seen many sports persons excel and reach their potential under his guidance. About Fiona McNamara – Heatherdale B. C., Victoria. Click here to read Fiona’s story. Not many bowlers have their own bowling green in their backyard … some have, like former radio presenter Mark Thompson’s Nanna (Lorna Joseph) and the odd coach or two … but I’m not aware of anyone who has their own undercover (heated and cooled to suit) synthetic green to boast of, apart from Isabel and Frank Baguley. About Michael Scotter – Cranbourne B. C., Victoria. “On an invitation to join the Glenferrie Hill Bowls Club in 1984 Mick began bowling under the guidance of the great John Dobbie as his coach. He remained at that club for only a couple of years before having to discontinue in the sport owing to his work commitments both interstate and overseas. In the mean time he moved homes to Bayswater and eventually joined the Heathmont Bowls Club where he remained for 15 years. Click here to read Mick’s Story. About Peter Dixon – Mordialloc Bowls Club, Vic. Peter Dixon is a child of the sixties and it was indeed, a wonderful time to grow up with little restriction on how long and how far you could push your freedoms. It was safe to wander all day, as long as you were home for tea. Tragedy struck Physio, Peter in his prime. See how he overcame adversity, and found bowls. About Richard Sissons D. S. A. – City of Frankston B. C., Victoria. Richard was born in Fulham, London in 1936 and arrived in Australia in 1972 with his wife Jill, whom he married in 1957 and their son Gary, 3 sisters still live in the UK. He joined City of Frankston Bowling Club in 1998 where he quickly became and remains a most popular and active member. Richard over the years has assisted with gardens, greens and maintenance. In 2008 together with Alby Ashley, he was instrumental in organizing the first tournament in Australia for Armed Bowlers, and they called it “The Battle of the Arms”.